This is a very rare exhibit of olden days Yantra Cloth, and essential rarity for the Devotees of Luang Por Derm Puttasārō of Wat Nong Po (2403 BE - 2494 BE). The Pha Yant features the Mae Posop Goddess of the Rice and Crops, the Deity of Fertility and Rich Harvest. 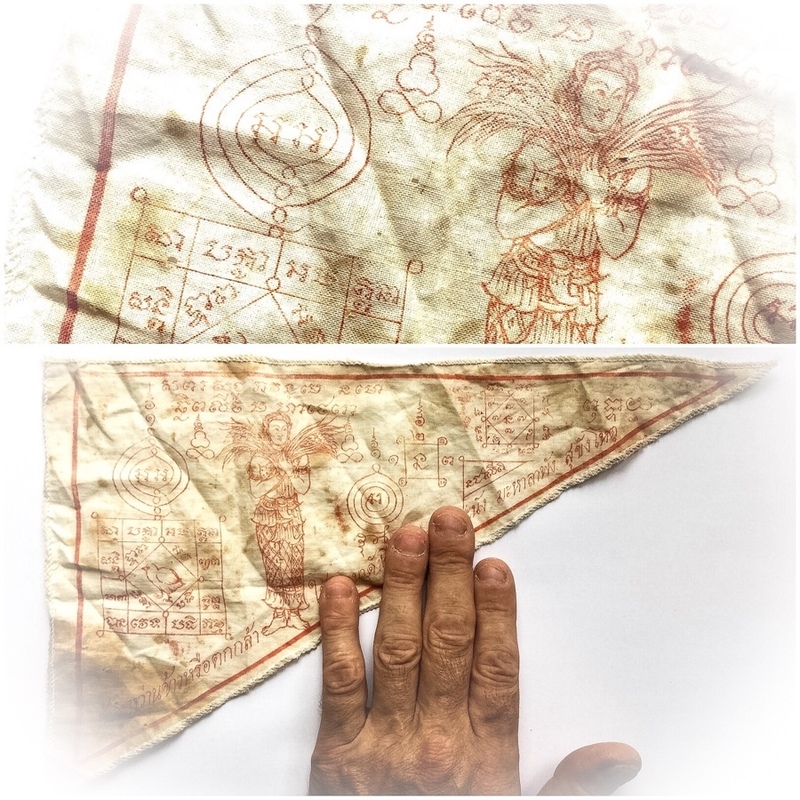 This is a very old Yantra Cloth, that is an immense Rarity to come across, from the times where Devotees would flock to the temple of Wat Nong Po, to beseech Luang Por Derm for his famous Pha Yant. The Mae Posop Grain Goddess is flanked by the Yant Nok Kum, Partridge yantra, which is not only Powerful Metta Maha Niyom, but also possesses the power to protect your premises from danger of fires. Other Sacred Na, surround the Mae Posop Goddess, and the Hua Jai Pra Sivali Mantra in a Triangle Yant, with a square Yantra for improving Prosperity and Success. Nai Pan was a direct looksit of Luang Por Tao of Wat Nong Po who was an ancient Master Sorceror and Abbot of Wat Nong Po. He studied for seven years with this Master Sorceror, until his passing.. When his teacher Nai Pan passed away, Luang Por Derm then continued to practice and study Wicha with Luang Por Mee, at Wat Bang Bon, another temple of the district in Nakorn Sawan, where he remained for a period of 2 Years. He also learned Tripitaka with Luang Por Num of Wat Khao Tong. The amulets of Luang Por Derm are far and few between to be found, for indeed the many devotees of Luang Por Derm, are never prone to part with their amulets, which are highly revered as Buddhanussati Remembrance of the Great Master, and considered irreplaceable for their Great Magical Power to Protect from Danger, Evade Hardships, and Nurture Success in LIfe's Undertakings.